Paris is a city that I return to again and again. The city feels like home to me — and for that reason, my more recent visits are less about sightseeing and more about chilling out. For me, what I enjoy most is the feeling of being in Paris. You can’t get that anywhere else. And I know that sounds rather obvious, but seriously, you can get a bit of a New York feeling in parts of Boston, or vice versa. Same thing with London and Rome, or Bangkok and Hong Kong. Paris, however, has no equal. If it’s your first time, by all means you should see all the sights you want to see. But also block out some time just to wander, sit in cafes, and feel the city envelope you. That’s how I plan my trips nowadays. Think less time in museums, more time sitting in cafes. 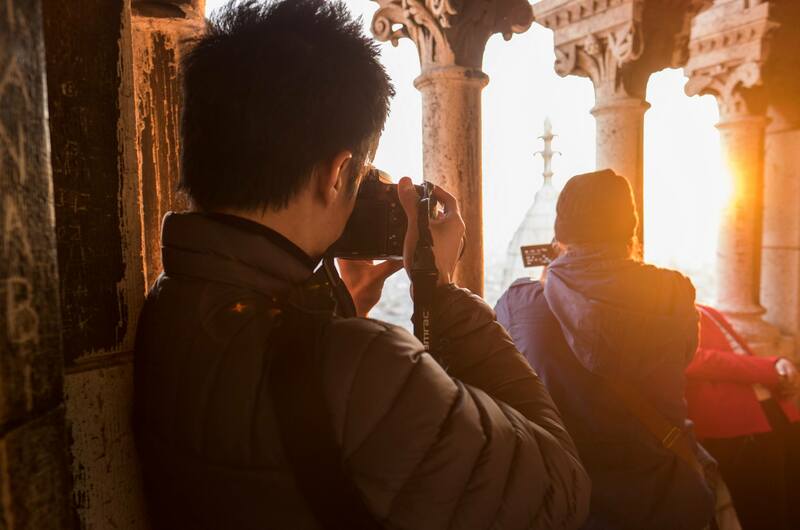 Fewer group tours, more self-guided photo walks. It’s all about feeling good, you know? And as a result, I got some of my best Paris photos of all time on my most recent trip last October. I hope you enjoy them. Here are scenes from a relaxed, chilled out trip to Paris. Life lesson to you all: befriend a portrait photographer and invite him to come hang out in Paris! My friend Jiyang Chen is an amazing portrait photographer based in New York — check out his work here — and he took a ton of fabulous shots of me in Paris. All photos of me in this post were taken by him. This one was in Père Lachaise cemetery. My favorite discovery of this trip was Rue Montorgueil, a street in the 2eme filled with amazing food shops. And it’s not overrun with tourists, either! This is one of my favorite buildings on Rue Montorgueil. I think I might frame this one for my house. One thing not enough people talk about is that Paris often has gray and overcast weather. Cloudy days are the norm; I once visited in August and it poured buckets every day. Make peace with the fact that the weather won’t be sunny every day, bring an umbrella whenever you go out, and you’ll be fine. Then again, you could be lucky. Don’t forget to relish the sun when it comes out! Jumping for joy outside the Louvre — and hoping to go inside for some macarons. And, um, a public bathroom (it’s before the ticketed area). Yeah, this is what it’s actually like at the Mona Lisa. Pastries, stop being so beautiful!! Ever seen the Sinking House before? It’s on Montmartre, close to the Sacré Coeur. The hill is actually at an angle, so if you shoot with the hill straight, it makes the building look like the Titanic! Oh, Paris at night. Even seemingly boring side streets can have the view of the century. Love locks cover the Pont des Arts, but beware — locks today are frequently removed to preserve the bridge. Ile Saint-Louis, the other little island in the Seine, has a village-like feel to it. It also has nice views of Notre-Dame from behind. 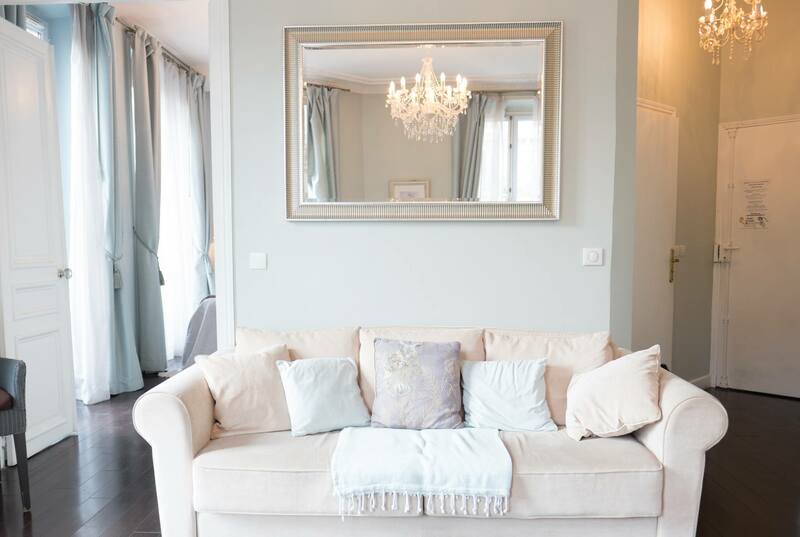 I’m a huge fan of Cobblestone Paris Rentals — it’s a rental company owned by two of my friends whom I met while traveling. Their apartments are gorgeous, luxurious, and SO Parisian. And when you check in, their guides give you the most thorough and detailed introduction to the apartment and the neighborhood, even giving you a list of things to do that you won’t find in any guidebook. I’ve never had that good customer service at any other hotel or rental company. You can learn more about Cobblestone in my Paris accommodation post. 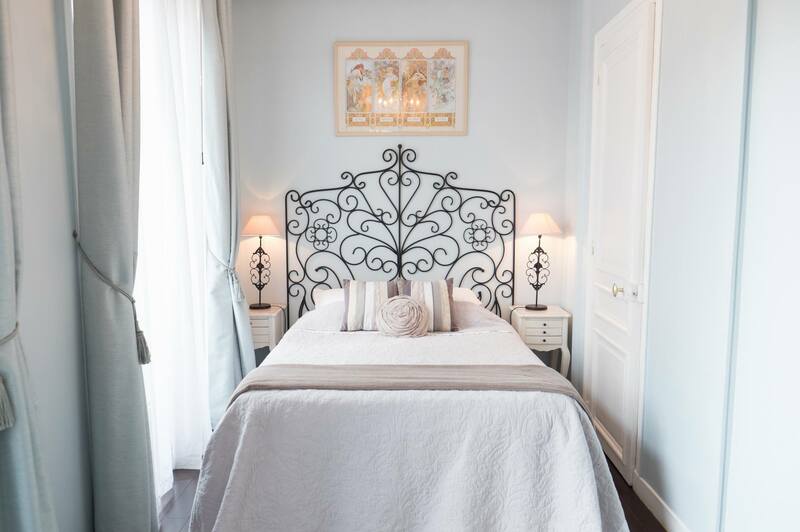 This apartment was La Charme du Marais. I love the details — the chandeliers. The mirror. The perfectly coordinated pillows and blankets. One day we headed to one of my favorite bakeries, Du Pains et Des Idées, only to find out it was closed for the weekend. We instead ended up at a sidewalk cafe eating the flakiest, most buttery croissants ever, and people-watching. If you want to shop, check out Galeries Lafayette. It’s super busy with tourists, but the atrium is a stunning sight. Ah, Paris. I love that you can order a salad and be proud of yourself for being healthy, then it comes with a mound of fried, melty goat cheese on top. I am completely in love with this photo, taken on top of the Sacré Coeur. You can see a few more on Instagram with the #loveisus hashtag. Jiyang captures a photo-ception! A selfie-caption? 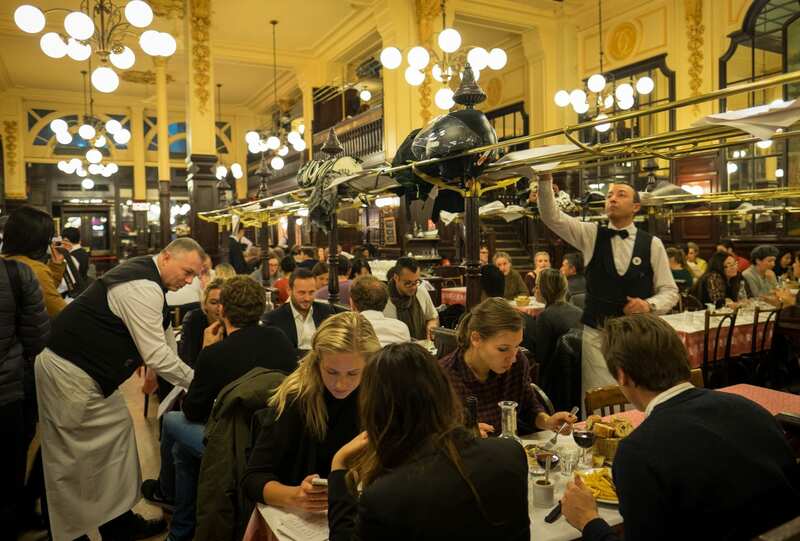 Chartier is one of my favorite restaurants in Paris. It’s got character for days, the food is delicious, and everything is shockingly cheap for Paris. Definitely go here but be prepared to wait in line. I can’t go to Paris without having escargots at least once. Sure, restaurants and cafes are great, but you need to have at least one dinner like this in Paris. A bottle of local wine, whatever fruit is in season, some cheeses, and some pastries. Magnifique. Père Lachaise is famous for its graves — Jim Morrison, Frederic Chopin, Oscar Wilde, Gertrude Stein, Molière — but it’s also a nice place to enjoy a quiet walk. Hot chocolate at Angelina was one of the suggestions of our Cobblestone guide. It’s worth every bit of hype. Have some and go window-shopping for designer jewelry in Place Vendôme afterwards. And finally, meet one of my new favorite spots to photograph the sunset: the rooftop of the Printemps department store on 64 Boulevard Haussman in the 9eme. The rooftop at Galeries Lafayette is another great option nearby, but I think the view at Printemps is slightly better. How could you not fall in love with Paris while looking at that view? 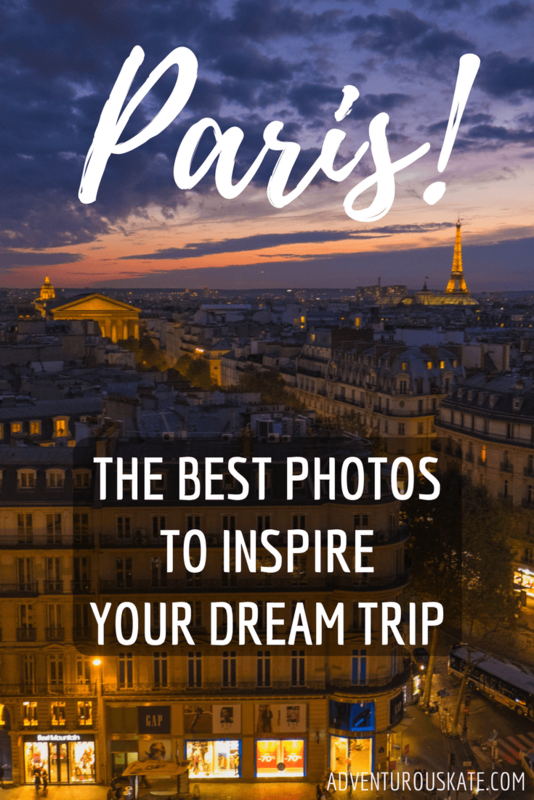 Essential Info: Paris is one of the cities I know best and I’ve created lots of flagship content to help you plan your trip. See all my Paris posts here. Definitely bring a Paris guidebook! Two that I recommend are Lonely Planet: Paris and Rick Steves: Paris. For the best hotel rates in Paris, compare hotels here. Don’t even think of going to Paris without travel insurance. Whether you cut yourself and need to go to the hospital for stitches, or your phone gets stolen on the metro, or an injury means you need to cancel all or part of your trip, travel insurance will help you out. 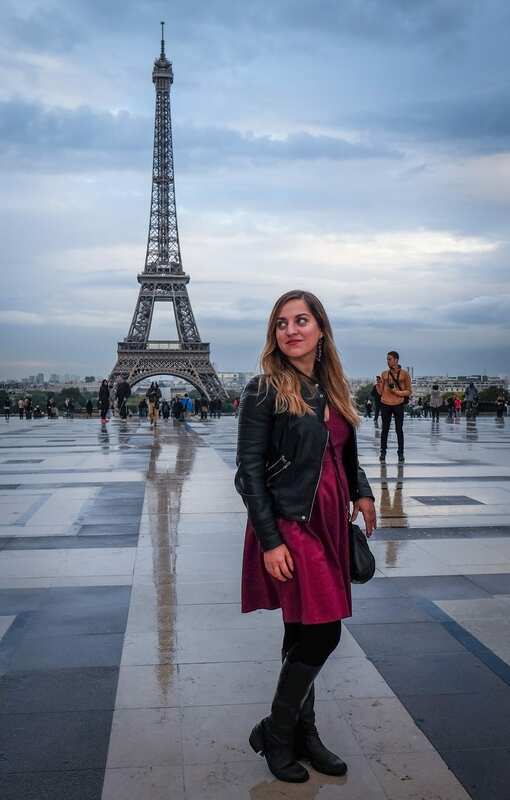 I use and recommend World Nomads as travel insurance for trips to Paris. Have you been to Paris? Is it your dream destination? Share away!